Wanting to blog for a while, my final surge of inspiration came when I spotted this little cutie while drinking my morning coffee, staring out the window, and waiting for consciousness to kick in. I noticed this little lady pulling moss off a rock by our pond and knew she was gathering nesting material. When I watched her fly towards this newly hung house, I could not have been more excited! Is she adorable or what??!! The picture is a little blurred through the window, but her cuteness still shines through! I bought this painted gourd at a local farmers market several weeks ago. Though I had hoped it would attract inhabitants, I assumed it would be like the last pretty birdhouse I bought…only a decoration swinging about in the breeze. This little chickadee seems not to be swayed by the breeze, however, and she and her spouse are busily nest-building and unknowingly entertaining me, and now hopefully you! or at the very least he’s double dating!! This, this is how I see Harold 99% of the time. The other one percent has been in the spring, when, to borrow a word from Thumper on Bambi, he’s “twitterpated.” Yes, like all animals this time of year, Harold, too, goes searching for true love. He has found it in none other than Henrietta, of course. Unfortunately, it is so rare, and he only does a quick fly-by…..kind of like a person trying to avoid nosy neighbors…that I have yet to get a picture of them together. 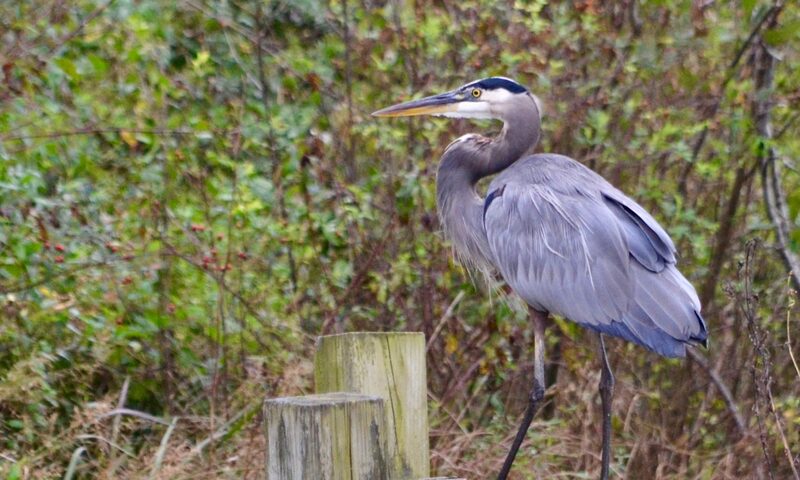 Imagine my surprise, when sipping coffee on my porch this week, (coffee and bird sightings seem to go hand in hand) I looked up to see Harold, and three other Blue Herons flying overhead! My mouth dropped open in shock and I said to my son, “Harold’s joined a gang!” Harold is usually such a loner, except for the rare sightings of him with Henrietta, that I had to get to the bottom of this. After some googling, don’t I love google, I found out that Herons nest in colonies called a herony, also less specifically called a rookery, which may contains more than one species of colonizing birds. The birds build nests usually up in the tree-tops, but will also nest on the ground or low lying structures close to their food source. The colonies can be small or large, depending on the area; Harold’s “gang” is obviously quite small. Unlike geese, heron usually choose new mates each year….poor Henrietta. The males arrive at the nest first and “woo” passing female herons. After quite the elaborate courtship ritual, the male may then present the female with a stick with which to add to or begin the new nest. Well, there you have it! The mystery of Harold’s gang is solved, and I’ve learned a few more interesting facts about my wonderful, grouchy, lovable neighbor! Last week my husband and I were sitting on the couch in the ‘nature room’….yes, that’s what I call our family room, but that’s another story…and, as usual, I was drinking coffee and staring out the window taking it all in. Suddenly, something white caught my eye sitting on one of the larger logs on the other side of the creek. It was low tide, so the fallen logs in the creek were quite visible, and evidently, perch-worthy. There is a large, white cat that stalks our pond for fish, entertaining our indoor cat, and terrorizing our outside cat – who, I have to say, I really thought was tougher than that. I started wondering how on earth she was able get across the creek and onto that log. I’ve yet to see her take a dip in our pond, so I was sure, like any cat, she wasn’t about to cross that creek, though sometimes I kinda wish she would. My curiosity was piqued! I quickly grabbed my camera to zoom in on this white thing, and as soon as I did, began snapping as quickly as my finger would allow! Yes, very blurry indeed:( But, no problem, I would just go out quietly on the back porch, walk down a little closer to the creek, zoom in, and have an incredible picture!! I couldn’t believe he was just perched right there for the snapping! I had seen bald eagles fly up and down the creek on occasion, especially during the spring, but never have I had a photographic opportunity present itself like this, with the bold beauty himself! I was wrong…on both counts. The better picture was not to be, and the eagle was anything but bold!! The second I very quietly opened the porch door and dared put one foot outside, this fierce, “bold” beauty darted for the skies! Are you kidding me??!!?? I just knew my presence that far away would go totally unnoticed. What threat did this big guy think I could possibly pose? Oh well, back to the couch, and my coffee, muttering my utter disbelief as I went. These delicate, winged beauties happily floated from flower to flower, seemingly oblivious to my hovering intrusion. Now that’s bold, and oh so beautiful! Oh, not to despair, I soon got another chance at that big, bold rascal! Do any of you have one of those neighbors, you know, the silent, grouchy, unkempt-looking, loner-type? We do. Our first meeting of him was quite unnerving to say the least, especially to my unsuspecting husband. Our first introduction took place the week we moved into our new neighborhood. It was a beautiful, August day and the tide was just right for a kayak ride. My husband and I pushed off quietly from the shore, excited to discover our new backyard. I was paddling in the rear, enjoying the beauty and solitude, when all of a sudden I heard a shrill scream from the banks. I happened to be facing this extremely, unhappy-to-be -discovered stalker, but my husband, unfortunately, was not! He jumped, really as anyone would, if only hearing the pterodactyl-like scream without having any visual of the culprit! As for me, after I got over laughing at my husband, it was love at first sight!! And now, you have been properly introduced to our neighbor, whom I have affectionately called Harold for close to four years! As the day winds to a close, I am thinking back on all the sweet moments and also the reminder I had today of a something I take for granted. It was a beautiful day weather-wise, sunny, mild temperatures as we headed out to church. I had my entire family with me, which is a joy I don’t take for granted. My older son used to call it “all together time” when he was young….and now that they are older and more independent, I really treasure our “all together time” even more. Indeed, it is one of the things I don’t take for granted or forget to give thanks for. The music was beautiful, as always . We sang the song “Because He Lives,” which brings back special memories of my grandmother. The sermon was meaningful, as always….but what I have gone back to in my mind all day was not the sermon, or the music, but something said off-stage. A dear widow sits in front of us and we have gotten to know her over the past two years just because of sitting near her. Like most church-goers, we all like our ‘assigned seats’ and get to know those in close proximity. She is usually chatty, and today was no exception, but in her greetings she paused and said “my son came over today, and he told me I looked pretty.” The way she said it, I could tell this small compliment meant more to her than her words portrayed. I affirmed that she did indeed look pretty, and I realized being a widow, living alone, compliments were not something she heard often. It was so obvious those words of beauty brought her immeasurable joy and reminded me of just how important words of beauty are, to all of us. How often I take compliments or encouraging words for granted from the ones I love. I am surrounded by an affectionate family and words of love on a daily basis. It has reminded me to treasure even the smallest words of affirmation, realizing that some hear it much, much less than their hearts desire or need. Hopefully, because of today, I’ll be more mindful of those around, who, for whatever reason, desperately need to hear beautiful words spoken into their lives. God Bless. For it blooms but once, and in blooming dies. And cares and toils for their good? The blood of its bosom — and, feeding them, dies. The snow-white bird of the lake? ‘Tis its only song, for in singing it dies. A greater and better than all? Before whom the hosts of them fall? To die for the life of His foes. The joy for the tear — the peace for the pain. While sitting on my porch last week – drinking coffee of course – I noticed a chickadee perching on this dead tree that I previously had paid very little, if any attention to. It’s early spring, so I thought maybe it was looking for holes in which to nest, but it wasn’t long before I saw another bird, the hairy woodpecker, pecking away looking for insects on this same tree. Needless to say, that chased away the chickadee, who perched on a small branch to the side of the dead tree, waiting for the bigger guy to get his fill and move along. He was in for a wait, however, because in moments hairy was replaced by the even larger red-bellied woodpecker….who doesn’t just peck, but hammers away! A closer look at the beak in the below picture of “red” reveals his hammering produced a tasty treat. In my mind, this little dead tree was going to provide many photographic delights in the future, and I was more than up to the task. Fast forward several days….my husband had contacted people to come and clear away some of the brush and fallen branches, and yeah, you can guess where this is leading…. right up to the ode. I had never mentioned my newfound delight in this little, dead tree to my husband, so my dear, dead tree was part of the doomed. I’m not going to wax poetic or resemble anything like an ode should be, but suffice it to say, I sure am going to miss that little, dead tree and all the moments that could have been. Welcome! I am so excited to finally be the “owner” of a blog dedicated to the beauty of nature God so wondrously and artistically crafted. After moving into our present home, which I call a nature-lovers paradise, my husband and I quickly realized it would be negligent, maybe even criminal, not to upgrade to a camera that does not also make phone calls. Since purchasing the camera, I have loaded down my computer with literally thousands of photos, (not all postworthy!) so a blog seemed the perfect place to share these pictures and write about my love of nature. I hope you’ll join me and together we can leave the business of life behind for a while and just enjoy the wonders and beauty that daily surrounds us!